I really like the camptosaurs - that's a species you almost never see anymore, but I remember them from the dino books in my childhood. Particulalrly this one by John Sibbick, where they're coloured like pinto ponies: https://4.bp.blogspot.com/-QDfW-Hl_x6M/VHTZHnwjyyI/AAAAAAAAEj8/q4tvaWUfDPg/s1600/Camptosaurus.jpg I guess I thought they're be fun to put a saddle on and ride! Thank you Viergacht, I'm glad you like Daisy and Copper. They're one of my favorite illustrations so far. I have a bit of a soft spot for ornischians. They just don't get enough love, but if we could have paleo pets I'd bet there'd be more of these guys than predators. Even if they are fully domesticated like the ones in my book. Thank you for sharing the picture. I love Mr. Sibbick's work, and I don't remember seeing those camptosaurs before. It may be outdated, but I always love how his subjects look like real animals. Not the monstrosities mashed together with computer filters, like so many illustrations in kid's books these days. Hello everyone! It's been awhile, but I hope you'll like what I have here for you. The website is running nicely, and things are looking quite good (if I do say so myself). I'll try to get better at posting things here more, instead of keeping it all to myself. I'd really like to make sure I'm on the right track. First up is Picasso for a quick hello. You can click on him to learn a little more about him. 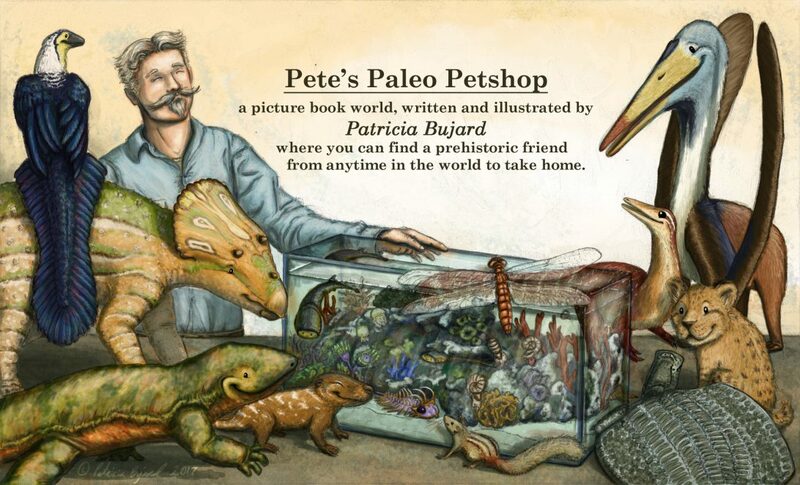 Picasso is one of the many prehistoric friends you can find at Pete's Paleo Petshop, where you can find a friend from anytime in Earth's prehistoric history. The pet shop is the setting for a children's picture book series I'm working on. Something that will have cute but accurately illustrated prehistoric critters. It frustrates me when all I see on Amazon is either shrink-wrapped cg monstrosities, or overly stylized cuteness that vaguely resemble rubbery chinasaurs. I hope to fix that problem with this series. The book I'm currently working on is based on Jurassic animals, and follows a family who steps into the shop looking for a little, quiet dinosaur. Hard to find in an age of giants. Eventually I'll include books for all prehistoric time periods, including the Cambrian and possibly even Precambrian (bacteria and microscopic critters are cool too!). Since I'm just a mom doing her best to illustrate a satisfactory dinosaur book for her 3 kids, then I'd really appreciate all of you who know more than I do about these things. Here's a taste of how far along I am so far. - I have all basic, rough sketches drawn out in what's called a storyboard. It just gives me a basic idea of which images go where, and what I need more research on. Those are the black and white pictures below. - Next comes the color sketches for the "dummy". The colored pictures below are in this next step. With these I'm experimenting with color, lighting, and overall mood to see what best tells the story. - When all the pictures have a colored update, I'll print them all out in real size (10x10) to see how it looks in real life vs a computer screen. More coming soon! Now that I've come this far, there is progress I can actually show you. I think you do very good work. Was there a specific reason for making the feathers at the back of the Dilophosaurus's arms blue? Personally, I don't feel it looks natural as it looks like it's highlighting those feathers as though they were wing feathers when they aren't. (And Dilophosaurus is very far from winged theropods). No, there wasn't a specific reason. It just seemed a little odd for the only blue to be on the head. I imagined a rather elaborate visual display, rather like the dilophosaurus described in the original Jurassic Park book. Part of that included using the arms. In many birds and reptiles, the wings or underside of arms are often places with bright colors for display. Blue contrasts more sharply than the red does against the cryptic pattern, so I used blue on the arms. It's all speculative of course. I like to add a healthy dose of speculation along with the latest studies. Not nearly as far as All Yesterdays, but enough to illustrate a different perspective. It may look a bit unnatural, but a surprising amount of birds and reptiles have those small bits of pop to their colors. In lizards, I see this even on critters that have cryptic patterns over the rest of the body. But it may be a bit far to stretch this onto something with feathers. Most "pop" for birds is large areas of pure white on the wings. But you can almost go crazy on the head! I see, I didn't know that about the Dilophosaurus in the Jurassic Park novel. I can't think of any reptiles that have bright display colours on the back of their arms, what are they? Bird wing feathers change the shape of the body, creating a large surface. I personally don't think that bright colouration found on the wing feathers would support bright colouration on an animal's arms where the feathers are just a body covering. I feel that even if they don't have feathers, reptiles would be a better point of comparison in this case, since the scales are just a body covering too, rather than things like remiges and rectrices which are more like new body parts. These are just my thoughts of course, the Dilophosaurus should be as you want it to be! You're right on the reptiles Sim. After a quick Google search, the only reptiles that had brightly colored arms, were the ones that had bright colors in general. vibrant bellies or patches on the side are common though. A few bright red or blue armpits out there! I was just remembering incorrectly then. Ah well, the coloration was more of an experiment really. I wasn't intending to suggest "wing" feathers there at all. 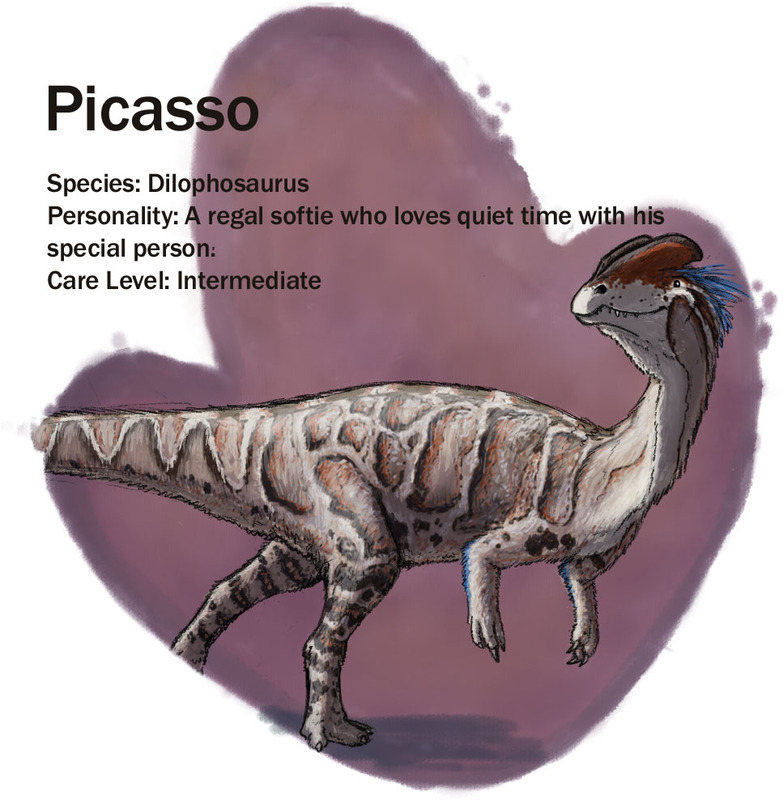 Picasso is a "domestic" dilophosaurus too, so perhaps someone selected for the unusual blue? You get all sorts of crazy colors through breeding. Just take a quick look at balled python color morphs. When it's done, it will be more like the home page picture on my website. Though even that already needs an update, I've changed the style of the critter's eyes since then. The dots weren't really working with the more detailed textures. None of the critters here are supposed to be anything specific except for the young triceratops. If you look closely, there's something from every major time period, from Precambrain on up...well, most time periods. The little Smilodon cub is representing the Cenezoic era. And yes, he has large, fleshy lips hiding his canines. I agree with the research that shows the saber teeth where not tusks, and therefore should be covered at all times. Hello everyone! I've had a small Ebook on Amazon for a while (since January). I haven't really told anyone about it since it was mostly just for practice, but now I want to fix it up and expand on it a little for a print version. What is it about? I'm glad you asked! It features Dippy the Diplodocus and his adventures with a rather large, yellow rubber ball. The illustrations are more stylized than my other illustrations, but are still based off of extensive research. And there are info pages in the book with information on Dippy's "neighbors", and the sort of plants you'd see in his "back yard". If you don't mind taking a few minutes of your time, I'd really appreciate it if you were to take a quick look and let me know what I can change, expand, or improve. I've set up a PDF of the book on my website so you can look through it for free. If you can catch typos, misinformation, or perhaps something interesting I could add I'd really appreciate it! What would you like to see in a book like this? Any feedback is helpful! Thank you very much for your time. Excellent! I like the panel composition for page four - gives a great sense of movement and pulls your eyes along for the ride. If there's one tiny crit, it's the last panel. Took me a second or two to read the image as a forefoot resting on the ball. Also, the expressions you give the dinosaurs are brilliant. I like the Jurassic neighbors page. Gives a very simple kid friendly understanding of the composition of the Jurassic. @Neosodon: I'm glad you like that page! It's missing a lot of critters of course, but hopefully the animals I included give a good idea on the diversity of the area. @WarrenJB: Thank you, I'm glad you like it. And thank you for the critique, that's exactly the sort of feedback I was hoping for. I'll rework that panel for the print version so it's more clear. Thank you again for taking the time to read it, and especially for going the extra mile to comment! It truly means a lot to me. Wait,is this important? Or it's just for looks? Thank you so much! I must say I'm pretty excited about the concept too, who hasn't wanted a pet dinosaur at one point or another? I'm glad you like it too. As for when it's coming out, I'm afraid I don't really have an answer for that. I work on it whenever I can squeeze some time in between my full-time job as a stay-at-home mom. I can usually manage to get about half an hour or so of work in before the kids wake up (I have three under 5), and then another hour during "quiet time", but even those moderately regular times can be sporadic. I'm learning to get very efficient with what time I have! I've discovered that picture books take a very long time to create, but I hope to be at least mostly done by October next year (picture books typically take two years). But you can see how the book is progressing here on this thread or Paleopetshop.com I will always update the latest progress every week over on the website. For the longest time I wasn't too sure how much anyone liked the idea of Paleopetshop, but now that I know you're looking forward to it I'll work on making more progress faster! Nothing like knowing someone is waiting for you to get a boost of motivation! Thank you! In between "stages" of the picture book, I'll also be working on shorter "minibooks", like Dippy vs. Ball. Right now it's only available in Ebook form, but I'm fixing it up to make it available in print. I'll be doing 6 little short stories based on the antics of critters around the shop, but aside from that I'll be focusing on the picture book. I want to get to all the other time periods eventually! I have a couple more critters to post up here today. This is Bowser the Ceratosaurus. If you click on his picture that'll lead you to a silly little quiz on the website, Which One is the Dinosaur? It's geared to kids and their parents with a more casual interest in dinosaurs, but I'd appreciate any error checking. Thank you for understanding. I never knew it would take so long either. I was struggling with a novel at the time and thought, "drawing a bunch of pictures for a book would be easier". Boy did I underestimate what I was getting into! But slow and steady progress is better than no progress. So I'm grateful for that, and having a blast while doing it! Picasso is one of my favorites too. For me it's a tough choice between Picasso and Skittles. Another critter! And now I'm at the halfway point with working on color sketches for a "dummy book"
Thank you Kaprosaurus, I'm glad you like little Terry. And you're right! I'll be publishing Gulper's post first thing tomorrow. At the bottom of the page there is a little window you can type in labeled "leave a reply". You should be able to click on it to leave a comment. Of course, I'd love to hear from you here if that's easier, but I'm on the website just about every day. I come on the forum about 2 or 3 times a week, so may not reply right away. Yes, the dummy book is a prototype of sorts. I've printed out each illustration I've sketched or colored (mostly as visual progress), but the dummy I will be sending to a professional printer so I'll have a little book to hold. This little dummy book will be the first time I see everything in actual size (10x10 inches), since so far the drawings have only been as big as I could print at home without wasting too much paper. The cover will be of cardstock paper, so it's not like a real book you'd buy on Amazon or Barnes & Noble or anything. But it'll be something I can hold, look at, read to my kids...scribble notes on it...basically test it "in the wild" to see what needs to be changed before starting on the final illustrations. Thank you again for your kind words, they were so motivating I got two color sketches done this week! I'll post them tomorrow. Would you mind if I quoted your comment in tomorrow's blog post? This one. Of course I don't mind! I would comment on the blog now that I know how to do it,thanks!